Emerging from stealth mode with $1.25 million in funding from VantagePoint Capital Partners and others, ByteLight has today announced a bold goal: to revolutionize indoor, GPS-like location services. This isn’t an untouched space, as you have likely noticed. Google is currently fighting to be the king of indoor and outdoor mapping through a number of initiatives, including indoor maps for Android and the Business Photos program. On top of that, competing startups like the Wi-Fi-based Aisle41/WiLocate, radio-based Qubulus and CMS-focused Meridian make the area of indoor location services more complicated. ByteLight is doing something different from anything we’ve seen before, however, as it has developed a LED lighting-based service that is supposedly accurate to less than one meter and takes less than a second to compute. The system works through ceiling-embedded LEDs which send out a Morse Code-like blinking signal that is detected by your smartphone’s camera. The illustration above reveals a sort of triangulation-like system. HW: Who are ByteLight’s competitors? DR: There are no competitors that we know of that are using LED-based indoor positioning technology. However, there are a variety of approaches to the indoor problem, with WiFi being the most widely deployed today. WiFi is really good for “geofencing”, that is, verifying that a user is within a particular building. But when it comes to identifying the exact position of a consumer in say, a grocery store aisle, WiFi isn’t going to get you there. ByteLight’s sub-meter, LED based approach really shines in this situation – operating at the last inch of location granularity. HW: Are you working with any app developers or 3rd parties already? DR: Yes – but we have nothing public to announce at this time. HW: What is the imagined app experience for users? Will they need to point their cameras in any specific direction? DR: The user doesn’t need to point their camera in any specific direction – we can pick up both reflected and direct light signals. The processing is happening in the background, in the same way that a GPS chip runs in the background without user interaction. HW: How much does the installation of this system into any given location cost? DR: Our lights cost the same as any ordinary LED bulb. HW: How will the funding be used? DR: We’re using the funding to build our team, deploy at pilot locations, and expand our ecosystem of lighting partners. We will likely take additional investment as we continue to grow. ByteLight says it is planning to take this solution further, by helping places like retail stores and museums “provide location-based digital content, analyze traffic patterns and measure engagement.” This means finding the exact item you want in a book store only takes a quick search, and reduces the need for staff. It also opens up new opportunities for promotions, sales and gamification. 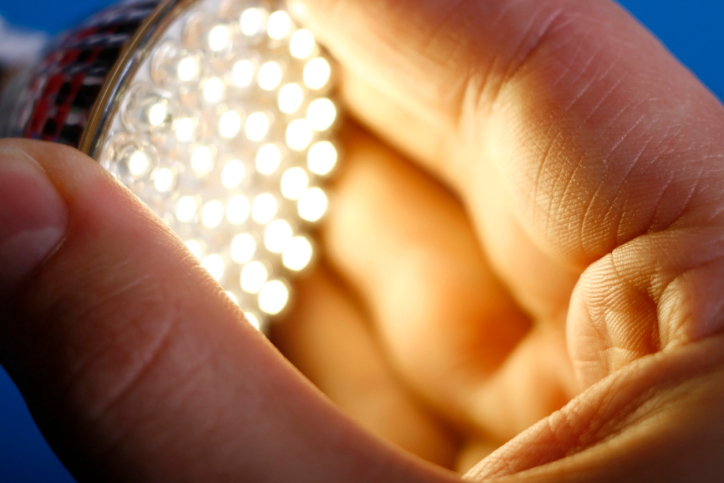 To make this all possible, ByteLight is partnering directly with undisclosed LED lighting manufacturers to license and incorporate ByteLight’s technology directly into their products. ByteLight has left much to the imagination as to how its system will work for the average user, and if it’s camera and LED-powered detection system has any downsides. For now though, the startup certainly looks promising as this new technology develops.